Unedited news footage of the Recommissioning Ceremony of HMS Ark Royal in the presence of Her Majesty Queen Elizabeth, The Queen Mother in Portsmouth. This would prove to be the Queen Mother's last ever official public engagement. 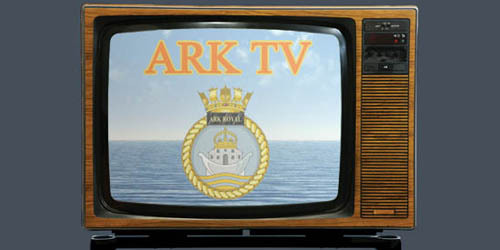 Filmed onboard Ark Royal as she returned from a Med. deployment on 19th June 2002. The single reached no.17 in the Charts in August that year. Filmed "on location" in Malta in September 2002 for the Ship's Company's Blind Date show (the show's hosts, Andy Wadham and Steve Card, are in the dinner jackets). A sing-a-long video created as a finale to be shown on the big screen in the ship's hangar on the Ship's Company's Top of the Pops night on the way back from the Persian Gulf in April 2003. The Chiefs' Mess have a go at recreating Status Quo's video for the Ship's Company's Top of the Pop's night. Ark Royal's Officers-Under-Training contribution to the Top Of The Pops night held in the ship's hangar in April 2003.